The last digital camera I owned was an Apple QuickTake camera in the late 1990s. It wasn't 8 megapixels, or 4 megapixels, or 2 megapixels, or even 1 megapixel. It was 0.3 megapixels. Since then, I've gotten by with camera phones and digital camcorder photos, but it feels great to finally have a real one. Although at 8 megapixels, I admit I'm overwhelmed. While my 2.0 megapixel camcorder could take photos, this camera gets down to the subatomic particle level. Anyway, back to the plants. Admittedly, I'm getting a little worried about the tomato plants. There are a whole lot of leaves and a whole lot of buds, but not a whole lot of flowers. 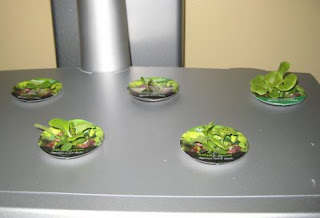 Plus, the plants were growing off to the sides and close to the lights. The kitchen floor looked a lot like our kitchen floor growing up after my dad would give us all haircuts. 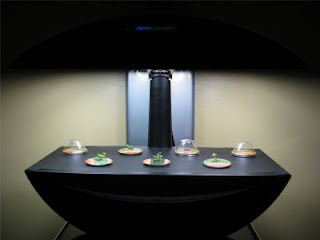 The one difference is that the Aerogarden did not run upstairs in tears because they knew they were going to be made fun of in school the next day, but let's not go there. It actually makes sense to prune the leaves, because they were getting big and sucking up all the nutrients. Some of them were getting brown on the edges because they were blocked from the light. Hopefully now most of the nutrients will go to the buds, turn them into flowers, and then turn them into little tomatoes. Here's one of the flowers, in all its subatomic glory. The lettuce, on the other hand, is doing quite well. All of the pods sprouted multiple leaves except for one, which had one lone leaf pop up. In fact, if I were preparing a salad for a Barbie doll, I'd be able to provide a very nice garden salad for her. On the top shelf, standing on my tippietoes, the oregano, sage, and thyme have all popped up. The parsley is still biding its time.